We are so happy we found Bruce. Our experience with Bruce from the very first contact with him… up until closing has been nothing short of fantastic!… Bruce is just that good. We bought from out of town. Bruce met us on Sundays to show us houses to accommodate our travel schedule. He REALLY listened to what it was we were looking for and what price range we wanted to stay. He NEVER tried to talk us in to a higher priced property. He treated us as though we were going to be his neighbor soon and wanted to do right by us. Bruce is punctual, professional, knowledgeable… and most of all personable. We feel we have made a friend with Bruce. I can't imagine anyone having anything but an awesome experience with him. 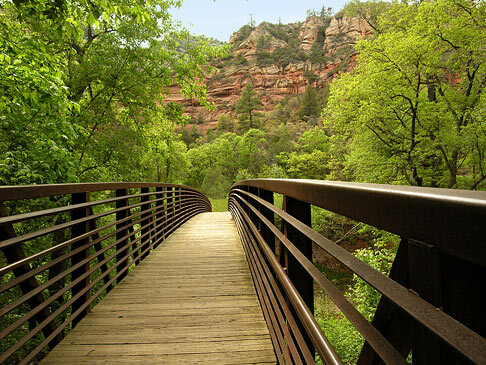 Sedona is more than a place; it's an experience, and once experienced, it’s never forgotten. 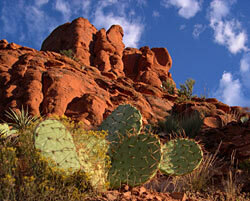 Sedona’s stunning natural beauty attracts visitors and new residents like a magnet. It grips the heart, soothes the spirit, stimulates the mind. And combined with Sedona’s active lifestyle and beautiful homes, it easily captivates visitors’ imaginations with the desire to live here. This is just one of the reasons homebuyers and real estate investors are taking advantage of Sedona’s current buying opportunities. Plus, Sedona’s home and property owners who’ve been waiting to sell see this current influx of buyers as their opportunity to move forward. And they’re putting their homes and property on the market. Just for a moment, though, let’s forget the market and look at the luxury homes and lifestyle in this place called Red Rock Country — one of the great wonders of the natural world. Luxury homes here are designed to turn each home’s unique view into an indoor visual masterpiece for the exclusive enjoyment of the homeowner. Also, with each home designed and built to become one with the landscape, no two luxury homes are alike. Sedona luxury homes offer an array of features almost as breathtaking as their views — imported wood, Italian marble, wraparound patios, exotic pools, cascading fountains and outdoor kitchens. Features also include floor-to-ceiling windows, majestic stone fireplaces, chef’s kitchens, plush media rooms, expansive master bedrooms with en suite bathrooms showcasing Roman tubs and much more. For many homes, the list includes mountain solitude, private canyons, scenic creek-front property or land bordering Coconino National Forest. And many offer limitless recreational opportunities such as access to private trails for hiking, biking and running. Simply put, living in a Sedona luxury home is a special lifestyle experience found nowhere else on earth. Add to this Sedona’s thriving arts community — anchored by the Sedona Arts Center, the Sedona Arts Festival, the world-renowned Jazz on the Rocks Festival and Sedona Film Festival — along with the numerous distinguished galleries that attract famed artists to make Sedona their home. 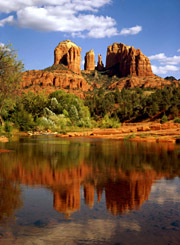 Sedona is also the location for over 70 major films including Call of the Canyon, Elvis Presley films and John Wayne westerns. Typical of the stars who’ve worked here are Henry Fonda, Joan Crawford, Robert Deniro and Johnny Depp. The burgeoning Sedona Film Festival, now in its 12th year, draws film stars such as Nicolas Cage, Debbie Reynolds, Jonathan Winters, Diane Ladd, Rip Torn and many others. Truly a magical place, Sedona offers one-of-a-kind experiences, not the least of which are opportunities to experience first hand the ruggedness of the land, mingle with world-class artists and film stars, dine in fine restaurants and shop in chic boutiques and friendly neighborhood markets — all while enjoying magnetic natural beauty and the casual luxury and comforts of your own exceptional Sedona home. 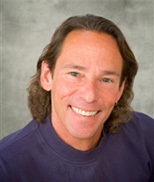 Whatever your real estate goals, at BruceTobias.com we want you to have an impeccable experience. This is why we handle everything for you ourselves — including answering our phone and responding to your emails promptly. We’re always connected, so please email us or call direct at 928.204.1950 anytime at your convenience.